Jeff talks about job considerations such as pay, uniforms, and schedules. Tim: So, you know, we're talking a little bit about jobs. I'm kind of curious. Do you prefer working in a group or do you prefer working alone? Jeff: That's a tough question. Tim: It definitely is because there is good things about both. Jeff: That's right. That's right, so I guess I'm good at working by myself because I am self-motivated so if I am doing something I like and I can get it done quickly I like to do it by myself, but if I'm working with a good team, a fun team, people who work hard and they all want to do a good job and get the job done well, then I think a team is fun, but you need guys, you need people, men and women, who work hard to do a good job so I prefer working in a team. Tim: Yeah, well, that's understandable. How about, do you prefer working and having a uniform or do you prefer putting on whatever you want to put on? Jeff: I think if you have a uniform too, sometimes you get respect. If you are are fireman or a policeman, you tend to get a bit of respect from the public but I wouldn't want a cheesy uniform with, you know, sort of like a strange hat or a funny looking bowtie. I wouldn't be into that, so. Tim: Have you had any jobs with uniforms? Jeff: Any jobs with uniforms? No, I don't think I ever had. If you call a shirt and tie a uniform, then yeah, but no, no funny hats or bow ties or anything. Tim: So, how about a working schedule? Would you prefer working a flexible schedule with like flex time, or would you prefer set hours: come at this time, finish at this time. Jeff: Definitely, definitely flex hours. Jeff: I think that a nine-to-five job is difficult to do. If you want to take some holidays, be with your family, or go on a vacation, or if the surfs up and it's a nice day you can go and just grab your board and go for surf but if you're on a nine-to-five job, you have no flexibility so definitely flex hours. Tim: So we are talking a little bit about hours. Do you prefer being paid by the hour or do you prefer a salary? Jeff: I think salary maybe is a better way to go because then if take holidays you get paid and if you're working paid by the hour, that style of work, you can't take anytime off because you know when you're not working, you're not getting paid so I think salary is a good way to go but as long as I'm getting paid, I don't really mind which way it is. I prefer working in a team. Well that's understandable. When a situation or opinion is 'understandable' it is easy to understand the reasons for it and why a person would feel that way. I think it is understandable that she does not like walking alone at night. I try not to eat too much fat, and I think that's understandable. Do you prefer working and having a uniform or do you prefer putting on whatever you want to put on? Here, 'putting on' refers to wearing clothes or accessories on your body. The example is asking: Do you prefer to wear whatever you want? When you are not at work and you don't have to wear your chef's whites do you put on whatever you want to put on? Do you prefer putting on whatever you want to put on or do you like wearing your school uniform? I think if you have a uniform too, sometimes you get respect. When you 'get respect,' it means that other people hold you in high esteem and think good, positive things about you. Once you start to treat people with respect, then you start to get respect back. I seem to get respect from my students. I wouldn't wear a cheesy uniform. A 'cheesy uniform' is a uniform that does not look nice and is tacky. They all laughed at me, as I had to wear a cheesy uniform. It is a really cheesy uniform, and I hate wearing it. Would you prefer working a flexible schedule with flex time, or would you prefer set hours? 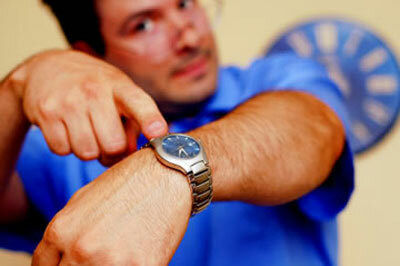 'Flex time' means that your work schedule changes from one day or week to the next. After I go back from maternity leave, I am going to work flex time. She is very lucky, as she gets to work flex time. Using special shoes in snow. Practical advice about Las Vegas. How much money is needed for Vegas? Lupe and Kara plan their next trip. When I worked at the summer camp, they made us wear these really uniforms. As a boss, it's very important that your employees you. All my friends like to dress in fancy clothes, but I just whatever makes me comfortable. Working at work makes it very difficult to plan the rest of my life. I think the fact that she is angry is very .